The other day, my daughter and I went to the pet store to get some food for the mice. While we were there, we made our normal rounds, stopping by to say hi to the parakeets, the rats, the hamsters, the chinchilla, the snakes, the lizards, the turtles, the fish, and, yes, even the tarantula. “I’m not so sure we’ll get anything,” I told her. With all the animal adventures we’ve had lately, two cats, a fish, and two mice are enough for me, thankyouverymuch. “We’ll just have to wait and see.” I hoped that would satisfy her. Let me just stop here for a second. I know this may give some of you the creeps, but I had pet rats growing up and I loved them. When I was a kid, my dad built a custom cage for the rats and we kept them outside. I don’t know how to build custom cages. Nor does my husband. And besides, somehow rats don’t look as cute to me anymore as they used to. “If I get a rat, I’m going to get a boy rat…” my daughter continued. Let me stop again. Nothing against boy rats, but we got a male mouse before we got the female ones, and it didn’t quite work out. On account of the fact that he was very focused on marking his territory inside his cage. Every square inch. Every five seconds. It wasn’t pleasant. And that’s when I snapped to my senses. And that’s when I realized she really does love rodents. An alpaca?? Sounds like a Dr. Seuss story. I couldn’t imagine living with mice. We have a cat and I think that is enough for me.. he he Although I am sure one day my son is going to ask for another pet but until then I am going to be thankful for no rodents. Is this what I have to look forward to?? More critters…Have a good weekend. I recently overheard a mother talking to another mother at my son’s school about what great pets rats are. I couldn’t believe what I was hearing! My son went through a time when he wanted some mice and my out was the fact that with 3 West Highland White Terriers who are bred to track rodents. Mice probably wouldn’t last long in our house. i am still trying to figure out how you have 2 cats in your house and all these critters are still alive?! my son has an obsession w/ getting a ferret. nope. will not EVER happen in this house. so cheers to you for being such a critter friendly mama! I am the same way with pets. I think I missed my calling and should be a small animals vet. We keep adding pets. This month it was aquatic frogs. We grew them from tadpoles. It is educational, right? My husband isn’t buying it. I love it!!! !I have found another mom crazy enough to let her kids have rodents. *big grin*We have gone through the mice. (The last one died two days ago, and I don’t think we’ll be replacing her.) We have had bugs of all sorts. My daughter now has two rats. You can read about the beginning of that journey here: https://surviving-motherhood.blogspot.com/2007/11/what-can-i-say-to-this.htmlThey ARE great pets, by the way. It was a big increase in responsibility compared to the mice, but my daughter was ready for it. Thought my mom was going to freak out when I told her I bought Elizabeth rats, but she got over it. ha!And now we have a puppy, too.It’s a little zoo-ish, but it’s all good.Thanks for making me not the only crazy mom “out there”! This definitely reminds me “If you give a mouse a cookie …”Keep us posted! My sister-in-law’s SIL has alpacas out in southwest Wisconsin. She showed me photos the other day, and I can’t wait to post about them. But really, once you have one critter, don’t you think you’re destined to have more? She is too cute! And you are a good mom because I don’t know if I could do any rodents! Even if my daughter loved them. And I was worried about blessing my son with the fish he’s been begging me for his birthday! Suddenly that doesn’t seem so bad. :) Have a super weekend!!!! That is cute. Only a Basset hound for us! The rats are what we’re trying to get RID of (they come from the park behind our house and steal dog food) – ha,ha. So funny! I’m not one for rhodent pets, but maybe that is because we frequently see them here on the streets. Not cool! Wow, I’m feeling pretty thankful for our golden retriever at this point! I’m one of those people that can handle holding a pet rat, but would never want to own one. However, the pet shop IS a very dangerous place for us to visit. I’m thankful I have a husband who has no desire to have any small rodents for pets so I can say “NO” on account of Dad to anything the kids fall in love with, otherwise…. we might have a house-full. My daughter is like that about cats. She has a true, deep love for them… takes after my mom for horses and my husband’s mom for dogs. I’m like that about chocolate. haha. Oh you’re a good mommy to let her have any rodents. I’m so glad my kids haven’t asked yet. 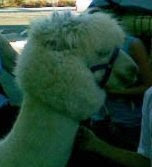 Such a cute story though!Was that Alpaca really going into the pet store with it’s owner on your way out? Angie,Yes, it really was. :) (We were at Petco, so you can bring your pets in.) Their slogan is true…it really IS where the pets go. ALL kinds of pets! LOL. How cute. Not the rat part. That creeps me out. But your daughter’s heart is just precious. The rodent thing I can forgive her for :)By the way, thanks for stopping by my blog! BTW, got a Great New Giveaway going on over at my place, to commemorate my 100th post–please stop by! I love reading your conversations with your kids. How cute is that? She sure has a heart for animals…err…rodents :0 You are a good mom. I would never allow a rodent in my house. They just really freak me out. I have a dog. That is about all I can handle for now. Oh, I don’t even know how you held your tongue! It’s funny from this side of the computer. I’ll be praying for long lives for those mice . . .
We recently celebrated..I mean mourned the death of our two guinea pigs.I can so relate my friend. The other yucky thing about male rats is the way they drag their, um, male bits around. Eww!